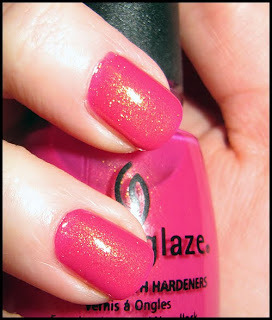 NOTD: China Glaze Strawberry Fields - Cherry Colors - Cosmetics Heaven! I got this lovely lovely nail polish from the even more lovely Nihrida (Thank you dear!! ), you HAVE to check her out, her blog is pure awesomness! 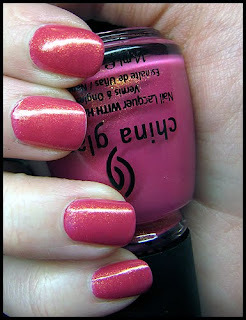 And it is my first CG nail polish ever... And you know what? I am madly in love. 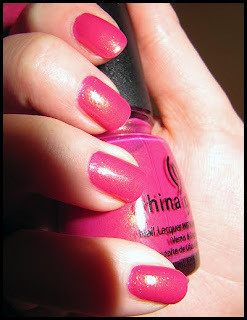 It is a gorgeous hot pink with golden shimmer in it, which makes it a warm toned nail polish. It is a bit runny, but because of the thin brush the apply was really easy. Now I know that this won't be my last CG nail polish ( I have added another nail polish to my WL - Orange Marmalade ... okay the whole Summer Days collection!!). Do I hear you go like OOOOH? !